Q: Is it possible to have the "parent" item be purely an image but the dropdown portion of the menu being in regular text? What we want to do is show emulate a basic text look for the main menu headings but the font is a special font so we have to use an image. When hovered over we'd like to replace the image (i.e do a rollover) with the same text but a different color. A: Yes you can create such menu. You should use images for the main items. 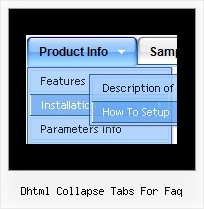 Q: Where in the interface is there an area to make a tab selected or not for the div tab menu?